I woke up at about 4:30 this morning to drive to my transect. For some reason it feels weird when you are in the car alone without the radio or a CD playing so I put on some John Mellencamp. And for some reason the lyrics to my favorite song on the CD went right along with how the morning started. I couldn't find the roads that the map showed and don't believe they actually exist. I evenutally decided to go all the way to Casper and take a road out of Casper. It worked and I got there at about as late as I possibly could have to still do the bird survey. It was a pretty good transect with many Brewer's Sparrows, Lark Buntings, and three Golden Eagles. I then drove south of town to find my next transect. I found more Golden Eagles, a few Lazuli Buntings, and a McCown's Longspur. I also saw my first ever (alive and wild) Badger. After tomorrow's transect I will be taking a few day break in the southeast part of the state. 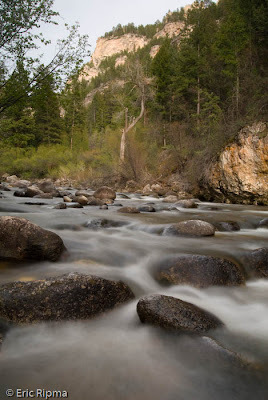 This is one of the many beautiful creeks in the Bighorn Mountains of Wyoming. Beautiful shot! I love the perspective. Beautifully captured. Love the water foams. Beautiful beautiful photo - I love that scene! I missed this last week. I'm sorry I did. It's getting hard to get to everyone but at least I got to see it this week. Stunning as usual! You always shoot a lovely photo and this one is beautiful. ...and a lovely photo of it too.